RSS Feed for keyword: "Eagle Pictures"
Eagles represent many things in our culture; for some the use of an eagle represents power and dignity, while for others they mean freedom and majesty, but one thing is for sure, eagles are beautiful, regal and mysterious. They can be very hard to photograph due to them spending much of their time in the sky and the trees, but when one is captured on film, it gives us a rare close up of what an eagle truly looks like and how amazing they are. Interesting Photo galleries related to "Eagle Pictures"
...Continue gallery information: Both of these areas are well known for their bald eagle population. Brackendale on Vancouver Island is considered the home of the Bald Eagles in the winter. Thousands head there every year as they know they are guaranteed food due to the migrating salmon that pass through this region. From mid-November to mid-February Bald Eagles can be seen in the trees and along the river bank and prime viewing for them is in December and January. There is also an Eagle reserve in Brackendale started by Thor Froslev and Len Goldsmith. This 550 hectare area protects eagle habitat so they can continue to breed and flourish. Homer Spit in Alaska is also a heavily populated area for bald eagles, and it is also known as the halibut fishing capital of the world. There is a healthy salmon presence there also hence why so many eagles go there every year to feed, just like in Brackendale. The main reason the eagle population is so large still in Homer Spit is due to the work of Jean Keene, who took it upon herself to feed the wild Bald Eagles that came to Homer Spit every year. Now it is illegal to feed the wild eagles in the area, but Jean Keene wanted to preserve the population and so drew both criticism and praise for attracting so many to the area. She passed away in January 2009. One of the most amazing things about eagles is the way they can soar through the air on their wings and their ability to see their prey from miles away and then swoop down to take it in their talons. Watching an eagle in the wild gives one a sense of freedom that we can never have, as we cannot fly above the tree tops and spend our days floating on air. The fascination that eagles provide for humans explains why so many representations of eagles are used as symbols in our society. Here you will find our selection of Eagle Pictures and photos. 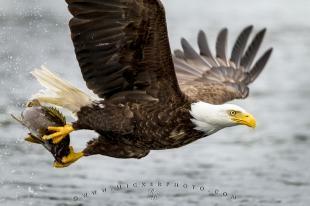 Most of the Eagle pictures are taken of Bald Eagles in Brackendale, Vancouver Island, and on Homer Spit in Alaska. All of these destinations are wonderful vacation spots and are great for bird watching, especially for Bald Eagles. 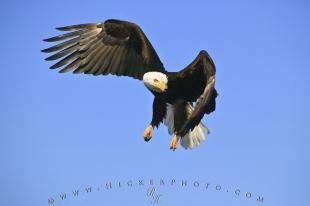 Bald Eagles are my favourite birds of prey although they can be very tricky to photograph! Enjoy our collection on Eagle Pictures. Other bird watching pictures are in our Bird Pictures category. Make sure to read our Story about Bird watching Bald Eagles in Brackendale, British Columbia.